Big chain doughnut shops do not thrill me. I will probably eat a Krispy Kreme if confronted by one, but I don’t crave them and I would not go out of my way for them. Doughnut Plant doughnuts, on the other hand, can hardly be classified in the same category as chain doughnuts. 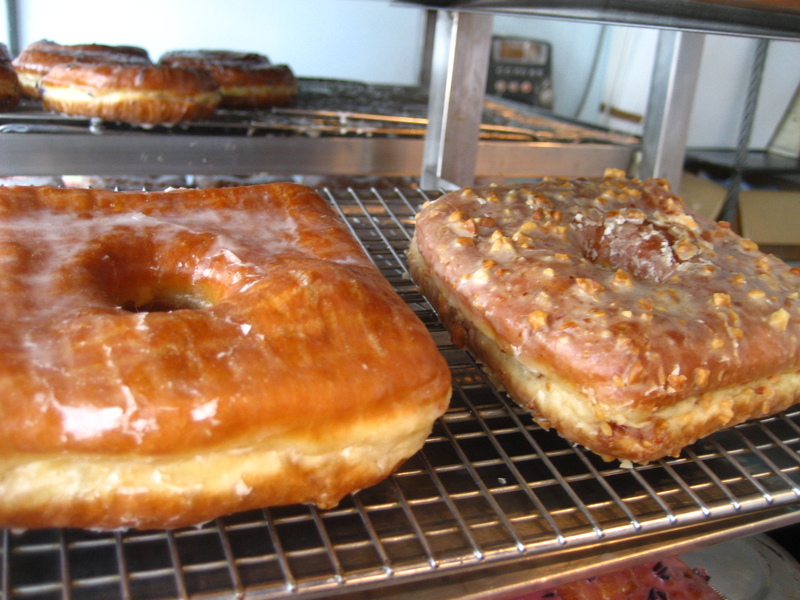 The Doughnut Plant makes both yeast and cake doughnuts. The yeast doughnuts here are really the star of the show. They are fat, airy and chewy. 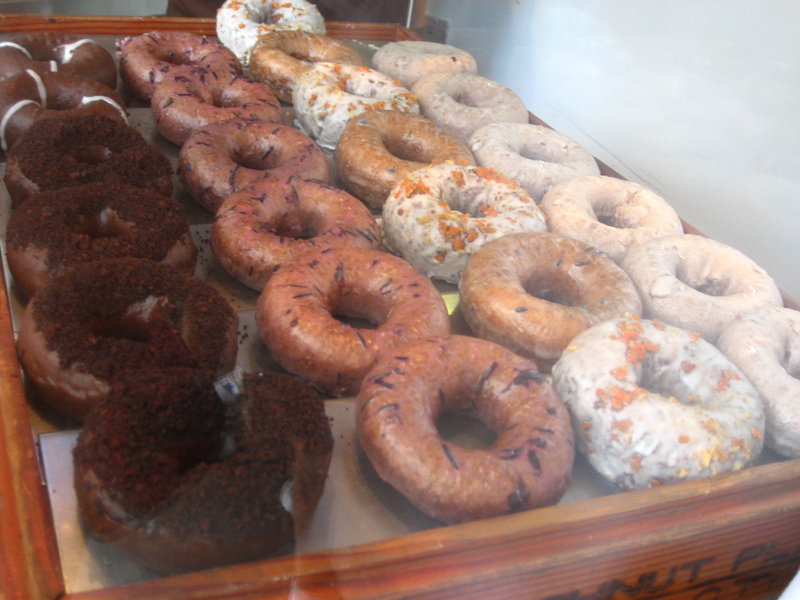 The different flavors come from a glaze that enrobes each doughnut. Standard flavors include vanilla bean and Valrhona chocolate. 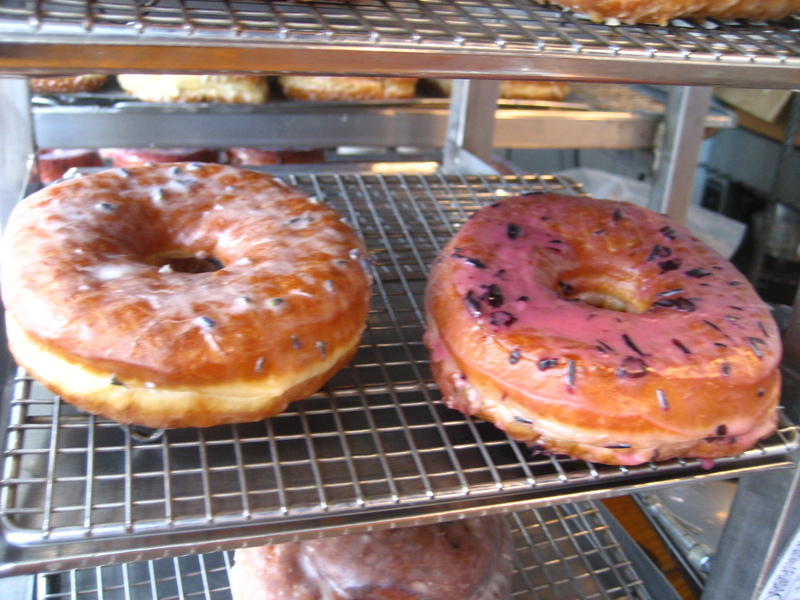 The Doughnut Plant has a rotating selection of seasonal flavors that right now includes lavender flower and blueberry. Other featured flavors include pomegranate, banana pecan, strawberry and rose petal. As if those flavors aren’t enough to intrigue you, Doughnut Plant also offers the very popular creme brulee doughnut, a small round, cream-filled pastry sans hole, and square-shaped jam and cream-filled doughnuts. The creme-brulee doughnut is the smallest item at Doughnut Plant, but be forewarned that it is very rich and very sweet. The middle holds a thick vanilla custard and on the outside is a burnt sugar glaze. I love the flavor of coconut but I dislike the texture of grated coconut. The coconut-creme doughnut has only a minimal amount of grated coconut in the glaze and a sweet coconut creme in each of the four corners. I quite enjoy this one. The structure of the filled doughnut is well thought-out. Instead of a dry first bite and then a huge glob of filling in the middle, the creme (or jam) is distributed more evenly throughout. The cake doughnuts are richer and pack more sweetness into a smaller vessel. Eating one is definitely, as the name would suggest, like eating cake. Recently, I tried the carrot cake doughnut and the tres leches. As a devout carrot cake lover, I wan’t thrilled with the doughnut version. It was okay, but much like a greasier, less carrot-y version of carrot cake. I prefer the real thing. The tres leches was much better, with pockets of the milk mixture dispersed throughout and a thick sugary glaze on the outside. One of the best things about Doughnut Plant doughnuts is that they are made with high-quality ingredients and you can taste this. The flour is organic. 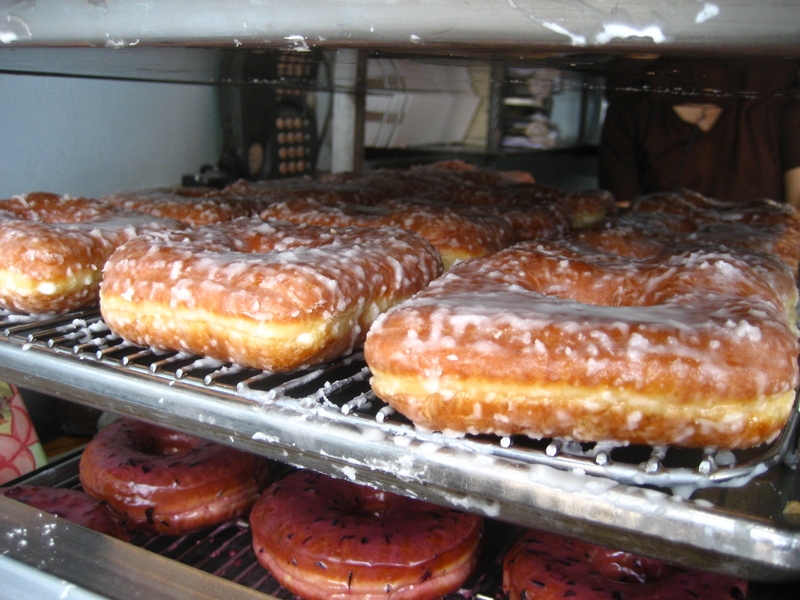 The jams in the doughnuts (of which there are several) are made in-house. Owner Mark Israel, who got the recipe from his grandfather, makes the doughnuts fresh every morning. He uses fresh fruits, nuts and flowers in his glazes. If you thought doughnuts weren’t your thing, I challenge you to give these a shot. 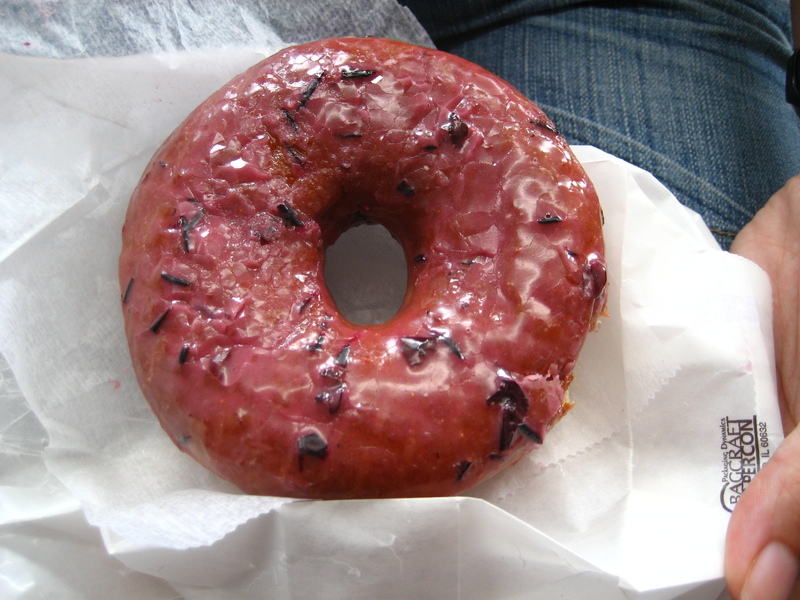 This entry was posted in New York, Reviews and tagged donuts, New York. Bookmark the permalink. Lady, all your NY trips with all these beyond amazing food photos are killing me! I need to make a trip asap, and thanks to you I already have a list of all the places I need to go :] This donut shop might have to be my first stop though – ummmm coconut cream looks/sounds like a dream (did not mean to rhyme). 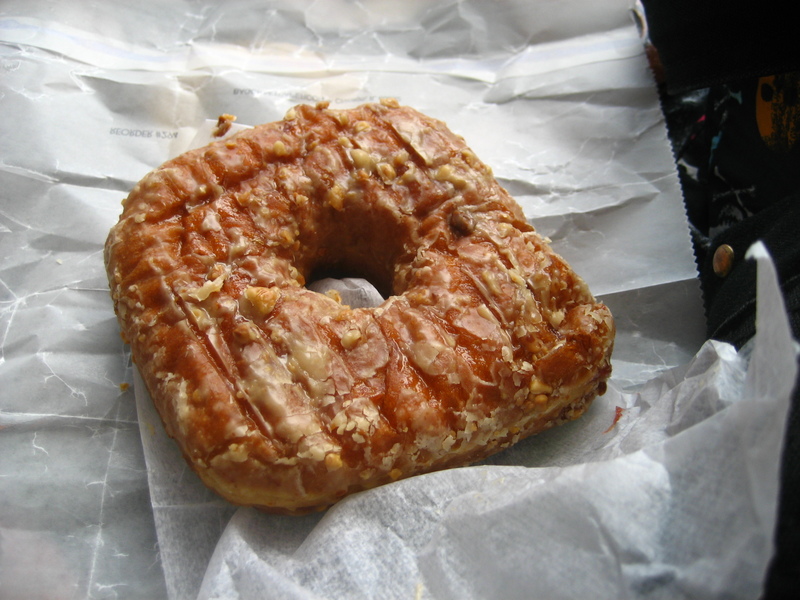 Also I have this thing where square donuts always seem to taste better/never fail to just look more appealing to me, so a win-win for that situation. This is my favorite place in the city to get doughnuts. The creme brulee doughnuts are to die for! After seeing your pictures, I must get myself to the Doughnut Plant!